Shalini is Director, Publishing Services. She is based in the SAGE New Delhi office. 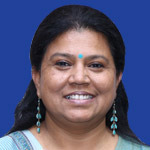 Her career at SAGE India started as a Marketing Manager in 2005. In 2007, the Publishing Services division was formed and she has been heading it since then. This division provides various pre-publication and management services to all SAGE group companies. Since February 2013 she has been given the additional charge of Editorial and Production, a division that takes care of pre-publication, management and content delivery for SAGE India's publishing program.